After last week's interview with OSWtv's Billy Strachan, it's time to step back in time with Lewis Ogden of the Attitude Era Wrestling Review! I can remember certain vivid bits of Austin and McMahon in '99, always watching WCW on a Friday night on Channel 5 when I was 6 years old and The Rock as WWF Champion in mid 2000 is probably when I first became really interested. My brother had loads of wrestling mates while he was at school, and a couple of them always used to tape the PPV's and we'd get a copy sometime during the week. Two that stick out were No Way Out 2001, with the epic 3 stages of hell between Austin and HHH, and the Invasion PPV, WCW + ECW vs WWF, that was awesome!! I've always been a stickler for a match telling a story, as if its real (its real to me dammit!! ), and i still to this day take into account when people find out that i watch pro wrestling and they tell me its fake, its one of those situations where i would love to take the same person, stick them in a wrestling ring, and make them do an hour of running the ropes and taking bumps. Then asking them straight after if they still think wrestling is fake. Athletic ability is a major thing i look for from pro wrestlers. Its the reason why Daniel Bryan and CM Punk and The Shield are the best things going right now. Another stickler for me when it comes to wrestling comes in one word; gimmicks! There's a reason why people like The Rock, Stone Cold, The Undertaker, CM Punk, The Wyatt Family and many more have become so successful, they ENTERTAIN us on a regular basis. 2. Tell us a little about Attitude Era Wrestling Review and how that all came about? I used to tell my wrestling mates at school that I'd make a wrestling podcast, its just one of those things that was put off and put off for years. Then after discovering OSW Review around November 2012, it gave me the inspiration to get another podcast going to entertain the millions (AND MILLIONS) of fans. So with Silvervision closing down, I made like hell and bought stacks of Tagged Classics and got my analysis head on. For the first 8 episodes it was just myself on my lonesome, but I truly believe episode 9 has upped the quality of the show for 2 big reasons: a) I got my longtime wrestling freak, and WCW wizard, Hamish to join me on the show and b) we transitioned into a video podcast, as I felt it would process into a better show. And we have the big rip off of What Bar Is He? with our own segment, that will be officially debut on our next episode, that's along the same line. However with me working in the local Tesco supermarket 30 hours a week, I try to incorporate products that I notice around the store, hence the name What Supermarket Product Is He? 3. If you could transplant one current superstar into the Attitude Era, who would it be and why? Oooooo thats a tuffy! I suppose what's really lacking from todays WWE is the mid card championships having any depth and story to it, thus losing its importance. If they're had to be anyone to electrify this section of WWE (no pun intended) I'd have to take Val Venis. Everything about him, his ring ability, his mic work, his image and gimmick are all awesome. Plus wouldn't you pay money to see AJ Lee incorporated into a Preachers Wife type of setup?! Without a doubt, THE greatest match I've ever seen. The story, the in ring work, the nasty bumps that both Shawn (botched moonsault) and Taker (head first suicide dive) took, the false kick outs, the commentary, the crowd reactions. It just all equalled into a perfect match and solidified these 2 men into wrestling history. I consider this the best main event in WrestleMania history (that or the triple threat at 'Mania 20 which was great). The No DQ stipulation added to a boiling feuded match, capped off by the promo package with Limp Biscuits My Way incorporated, greatest promo that WWF/E has ever done. Apart from the finish and the nose dive that was the Austin heel run, this was awesome. One of the greatest ladder matches and the match which propelled these 3 great teams and 3 eventual single careers in Edge, Jeff Hardy and Bully Ray. Considering also that for all these men it was their Mania debut and they hadn't been on that many PPV's at this point, the spots and chorography in this match was completely off the chain. Incorporating tables into it as well gave The Dudleys that extra arsenal to their gimmick, amazing match. We're currently in the middle of getting episode 10 sorted, we'll also be starting stuff on YouTube as well (blogs, Q&A's, video diaries, stuff like that) all links to do with AEW Review can be clicked upon below. Massive thanks to James Marston of Across The Pond Wrestling for the opportunity to appear on this great interview platform, much appreciated! 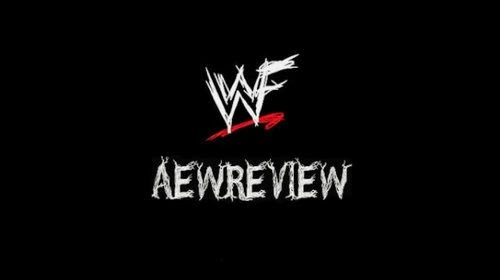 Thanks to Lewis for giving this interview, go and check out AEW Review NOW! Next week: Former WWE Wrestler, Zach Gowen!